What do you think? Is Lewisohn a hero or jerk? And will you be going to see the film? John Lennon: In My Life was written by John Lennon‘s childhood friend and original Quarrymen member Pete Shotton. They met in 1946, when they were the tender age of 6 years old while John was living at his Aunt Mimi and Uncle George’s. John and Pete would remain closed friends and confidants up until John’s death in 1980. And anyone that knows anything about John Lennon, knows that long relationships of any kind were something very rare for Lennon, making this story unusual. From the get go, the team of Shotton and Lennon (or as John would call them Shennon and Lotton) spelled mayhem wherever they went. Two young boys with very strong personalities, blood brothers, came together, both encouraging each other antics…they were to keep both their parents and teachers on their toes. Throughout their early years in Liverpool, both would be blamed for leading the other astray, all the while, pushing the limits and laughing their way through their childhood and teenage years. I loved the honesty in this book. Pete tells all the wildest and craziest stories from his and John’s days growing up in Liverpool. Anyone that wants to know the very dirtiest of details about John, needs to own a copy. This isn’t to say that the book is without it’s problems, especially when Pete seems to take exception to John’s dad and Cynthia’s mom both being supported by John. I do believe this is what is widely known as the pot calling the kettle black and any good Beatles fans could tell you that the whole staff (which included Pete Shotton) at Apple Corps in 1968 were living the ‘high’ life off of John, Paul, George and Ringo! Then again, the team of Shennon and Lotton were never known for the respect of parents or authority figures. I rate this book, 3 out of 4 Beatles! You can purchase a used paperback copy of In My Life for under $10 on Amazon or Half.com. How lucky are we? An old friend of my husband’s invited us to join him and his wife to see The Mersey Beatles at the Sellersville Theater. AND Julia Baird (John Lennon’s half sister) was there to introduce the band, sell her book “Imagine This” and do a meet & greet! I reviewed Julia’s book last year and gave it four Beetles. You can read that review here. Also, I did talk with Julia about the book I’m reading for next weeks review…but you’ll have to wait until next week to find out her opinion. The Mersey Beatles are just another Beatles tribute band. These guys all are childhood friend who were born in Liverpool. Sound familiar? 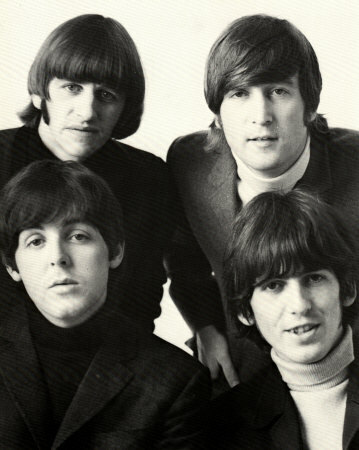 After realizing that they were never going to make it big as band and that they always got a great response when they covered songs by the Fab Four, they decided to create their own tribute band in 1999. In 2002, they became the resident Beatles Tribute band at the Cavern Club in Liverpool and remained so for 10 years! So what makes this band stand out? They do go through 3 costume changes with the early suits, then Sgt. Pepper’s and ending with Abbey Road dress. They bring just enough on stage banter in their natural Scouse accents without over doing it and losing the audience in some silly over rehearsed skit. At the same time, they will talk with the audience (they thanked the people who yelled out that they were killing it!) and they take requests. And some of their harmonies are really going to wow you! I rate this concert, 4 out of 4 Beetles! I don’t request review copies of new books too often. I prefer to spend my own money so I don’t feel obligated to give a decent review in exchange for the freebie. This time, it’s going to be difficult! When I first got my copy of Do You Want to Know a Secret? : The Autobiography of Billy J. Kramer I noticed the page count was only 180 pages. “Cool!”, I thought, “This will be a breeze of a read.” I should have realized that the low page count would mean there wasn’t much sustenance to this autobiography. I guess that goes along with Billy J. Kramer’s belief that after he leaves a stage, his life is his own and no one should bother him or invade his privacy in any manner whatsoever. So, what’s in this book? Well, Mr. Kramer marches nicely and neatly through his life explaining to us everything he hates and didn’t like about his career in the music industry. He didn’t like Dakotas, George Martin’s production on his song, his manager Brian Epstein’s choice of songs, the screaming girls at the concert or the fans that mobbed him after the shows. The only time I felt Billy J. was truly honest and interesting in the telling of his story was when he finally admitted to himself that he had a drug and alcohol problem. Unfortunately, after the telling of that period of his life, he resorts back to his arrogant “I did nothing wrong…it’s everyone else’s fault” attitude. I rate this book 2 out of 4 Beetles!